Please check out my PBS educational videos, cruise around my art galleries, and find public exhibitions of my paintings. Sign up for classes and demos, learn more about me and about my art, or commission a special painting. 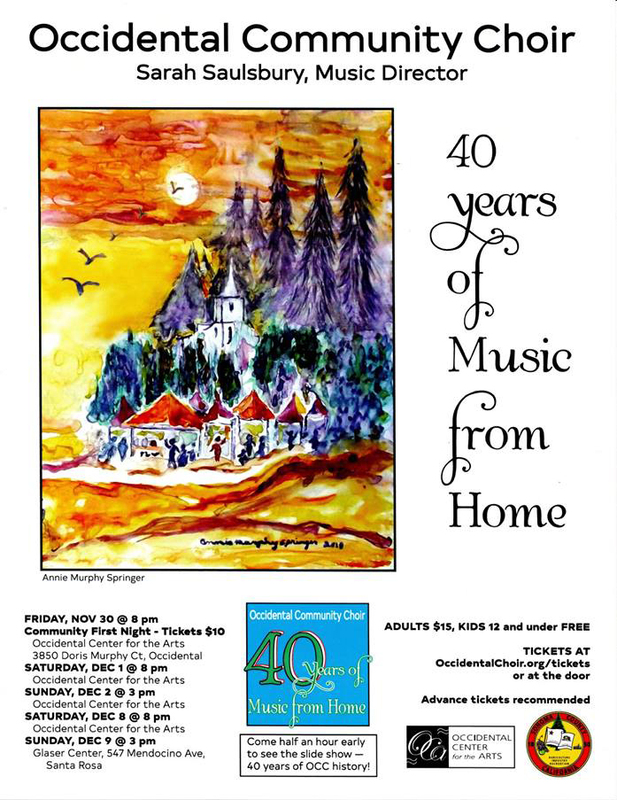 I have some exciting news.........I was selected by the Occidental Community Choir to create the art work for its 40th anniversary concert series. As many of you know, it is an exciting choir with all the music/words written by the members. I was one of the original members ! Please see the poster below and try to attend one of the concerts. Team with me to design a painting that reflects you and your dream. I specialize in creating personalized watercolor paintings in collaboration with you----doing extensive research, creating innovative color and compositional approaches, and especially creating an accurate interpretation of your vision ! I have an excellent reputation for carefully translating your ideas into a work of fine art. Scroll down to see several examples of paintings which I have created for my clients, read their the comments and learn how I approached their special unique requests. Please consider acquiring your own special painting now----contact me for commission details. Annie did an incredible job interpreting the quote "Give me a lever and a place to stand and I can move the world". She did this for a well known hospital and research facility. We really appreciated the talent and effort that she put into her painting interpreting this quote. This painting was commissioned to serve as a logo and motivator for raising funds for cancer research at a prestigious hospital. 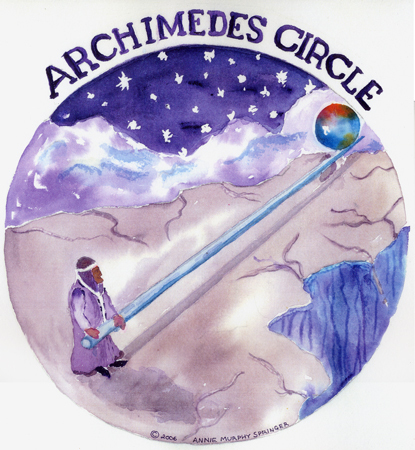 Donors capable of donating large funds towards a daunting financial goal were invited to join "ARCHEMEDES CIRCLE" as a reward for their support. At the beginning of the process, it was considered to be as challenging as that of Archimedes in his attempt to move the world. The most interesting question I had to answer in creating this painting was:.....Where would Archimedes be standing when he lifted the world ? He had to be in a believable place when he was given his lever----separated from the world, but within reach of it. I chose a very high celestial mountain among the stars as a metaphor to represent the intent of my clients. The original size - 11 inch diameter circle. I asked Annie to create the "Serenity Porch" painting after spending an afternoon sitting on the porch outside of her art studio aka "Annie's Tree House". Annie had invited my friends and I to sit quietly and take in all the breathtaking beauty of the surroundings. I was so taken with the peacefuless and serenity of that moment and I could hardly imagine anything more beautiful. I knew then that I never wanted to forget that moment. I gave Annie's porch the new name of serenity porch and asked her to create a painting just for me. I love how Annie took my vision and created my beautiful painting. It is one of my favorite pieces and I will cherish always. 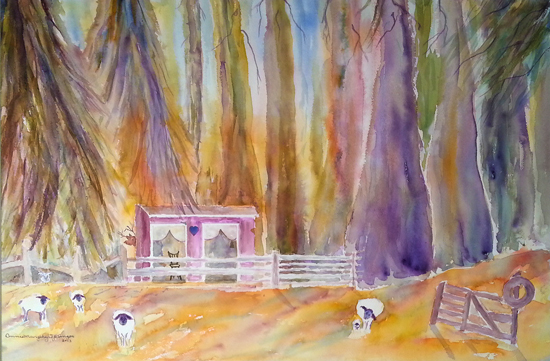 The small building shown in this painting is my personal "Tree House" art studio. It sits in a "best of two worlds" place backed by giant virgin redwood trees, facing east across a vast and open sheep ranch. Over many years, this small structure's porch has provided peace, tranquility and joy to travelers from around the world. Some of them have claimed that it sits in a place of "harmonic convergence". I know that Joyce immediately experienced this rare sensation and continues to savor it. She has traveled back on several occasions to enjoy the pastoral view of sheep wandering by and to watch the shadows of the setting sun on the far off trees. It is a very peaceful place. The original size - 40 by 28 inches. Client is traveling internationally. Testimonial is not available at present. 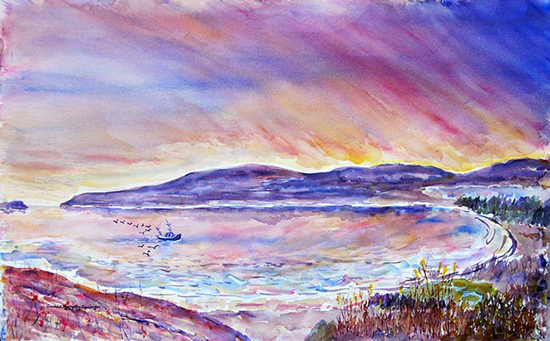 This painting was commissioned by an international traveler as she was about to leave after an extended stay in Bodega Bay, Ca. USA. She requested a painting which would include the many special things which were in her view from her windows on the Sonoma Coast. She especially wanted me to capture the dramatic sunsets over Bodega Head, her favorite walking beach, and a fishing boat returning to port in the evening. 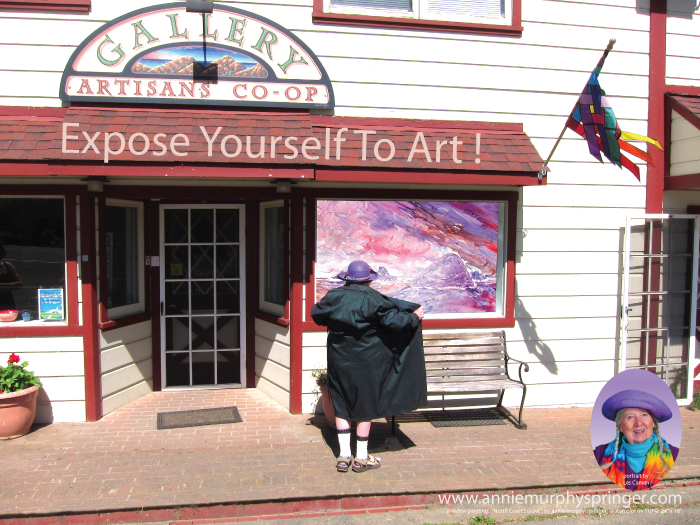 Her painting includes some images which are very personal to her and "hidden in plain sight" for her to enjoy! Goat Rock - our favorite beach on the Sonoma Coast. When my partner died I wanted something special to honor her and our memories. I asked Annie Murphy Springer to create a painting that was somewhere between reality and fantasy. Annie spent time with me listening to stories of my life with Martha and set about creating a vision that was both wild and serene, that captured the power of Goat Rock and the gentleness of Martha. This painting of the dramatic Goat Rock on the Sonoma County,Ca. Coast was requested as a tribute to my client's partner. For many years, they had enjoyed frequent visits there in all kinds of coastal weather, especially when the gigantic and wild waves beat against Goat Rock. There is a very special place on the dunes where they especially liked to view the drama of the sea and the wildflowers along the isolated beach. I went with my client to that spot and absorbed - with all my senses- the beauty and inspiration of the place, and made rough sketches from their special vantage point. As the painting developed, I included "hidden" and private/personal symbols recognizable only by my client. The original art without mat and frame measures 18" high and 36" wide. My wife and I saw Annie's work , and we both very much appreciated her whimsical unique style. We thought it was light, fun and also provided us a path to explore the place that she was painting, through her creative vision. When it was time to create the cover for the album "Beyond The Crescent Moon", both Karen (my wife) and I, wanted a creative theme for the artwork. We both missed the artistic album covers that we had grown up with in our earlier years. I had thought of Annie, and Karen was excited about the idea. I was also aware that she had not done an album cover before. Also, what made this a bit more complex, is that we had a threefold CD cover, so there was an outside and an inside, as well as the CD itself. Her "attentive" listening pleasantly surprised us, for Annie included our "very much loved & appreciated" Icelandic horses and Karen's favorite wildflowers were blended very aesthetically into the scene. Additionally, a classic planned mountain through the "magic of watercolor" elusively refined itself into the silhouette of our horse Tign, which just won us over. .... Annie is a very talented artist, industrious, resourceful and I'm really glad that she took on this commission venture with us. This painting was designed as the three-fold COVER ART for a wonderful CD album with this title, composed by Sam Eusten. Sam is a very talented Composer, Videographer and Producer who created the tranquil, meditative music on this album to be enjoyed by those who need respite from the stressors of our worlds---and don't we all ? Sam and his wife Karen discussed Sam's intent....to create visual "sound scape" images in the listener's mind of mountains, eagles, streams, flowers and animals as the crescent moon flowed into sunrise- a complex challenge. They introduced me to their beautiful horses and provided the California Poppies and other wild flowers for inspiration. As the painting emerged. the wonders of watercolor kicked in, and a number of "magic" things emerged in the painting such as a mountain that appeared as a horse in the sky ! Each time I was painting I listened to the album - a very inspiring experience. The three-fold cover format resulted in a painting (without mat and frame) of 9" high and 27" wide. To obtain a copy of this special album, contact Sam at www.sameuston.com or me at anniems@sonic.net. I love Annie's rainbows of color in her art. 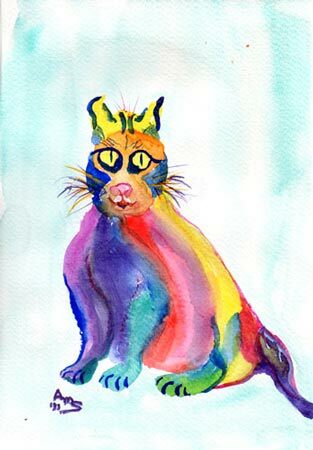 They make peole feel good, so I asked her to make a Rainbow Cat for my step mother who was suffering though cancer. Annie gave me a cat that exuded the joy I wanted Janet to feel. Now that Janet has passed on, that cat belongs to me, and I charish that it gave Janet joy while she was in so much pain. Thank you Annie for bringing light into our world! I created 3 versions of this cat, but this one has just the right "attitude" to make people smile !